Brief Synopsis – A male nurse travels with his girlfriend to her parents house in order to spend the weekend together with the family for her sister’s wedding. My Take on it – I have always had a soft spot for this film every since I saw it for the frst time in theater. The concept is superbly handled and it manages to work on numerous levels. The tone of the film is perfectly set and they give us a great scenario of something that most people have had to deal with at some point in their lives – meeting the parents of your significant other. Ben Stiller is perfect in the lead role because he is able to show the kind of awkward fear that someone would have in these kinds of situations yet he also is able to get the physical comedy aspects of the film just perfect which helps add to the enjoyment of this kind of film. Robert DeNiro, on the other hand, isn’t really known for his comedy yet manages to prove doubters wring because he is so perfect in this role it’s actually quite scary. He is helped by the fact that his characters persona is quite familiar to him with the tough guys roles he usually plays. His comic timing is perfect and helps make it all work so well. The script is great because they know how to take things to the line of extremely absurd and linger there for just a second always keeping things grounded throughout. This film has so many funny scenes and some of them will have you rolling on the floor because they are done so perfectly. Owen Wilson plays a small but significant role in this film and manages to steal every scene he appears in and that has to do with the fact that hos character is one of the funniest ones of the series because he sound so sincere in his comic lines and it seems as if he isn’t always sure as to what he is saying but still does i in order to impart his wisdom again and again. Bottom Line – Great concept that works on so many levels They get the tone perfect in the way that they show how difficult it could potentially be to meet the parents of one’s significant other. Stiller is perfect on the lead since he is able to get the trepidation of it all so perfect while also managing the physical comedy that makes this film so much fun. 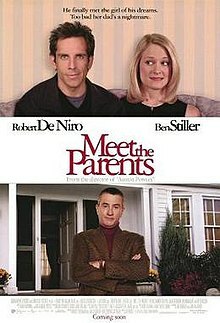 De Niro shows how great he can be in comic roles with this film and despite playing a persona he may be familiar with from his tough guy films, he still allows us to see how perfect his comic timing in with this role. The story takes things to the extreme yet keeps them grounded and there is so much to laugh at throughout this film because of how it is structured. Wilson steals every scene he is in by design yet remains one of the funniest characters in this series because of it. Recommended! I think this film was so successful being the scenario is so relatable.